Today is a big day for Gingr. We are proud to unveil what is perhaps our most anticipated features yet: in-house credit card processing, tip collection, and e-signatures. Credit card processing is a necessary evil when running a business in today's world. We've all dealt with this industry and usually come away feeling hoodwinked and bamboozled into hidden fees, complex agreements and long-term contracts with heavy cancellation penalties. If you accept tips, you know that your employees depend on it and that your customers really don't mind saying "Thanks!" That extra income comes at a cost to management though. They have to go through every receipt, every day and enter it into the system manually. Accidents happen, wrong amounts get entered causing out-of-balance errors, and inevitably some get missed entirely. You are likely used to having customers sign a paper receipt, performing daily reconciliation, and storing these slips of paper in a closet for years. If you have ever had to deal with a chargeback, you'll know that searching that closet for one piece of paper can take hours. Starting today Gingr can accept electronic signatures, collect tips electronically, and beat your current credit card processing fees! We've built a tip/signature collection application that works perfectly with the affordable (and durable) $99 Amazon Kindle Fire 6" HD, although any tablet or pad will work. 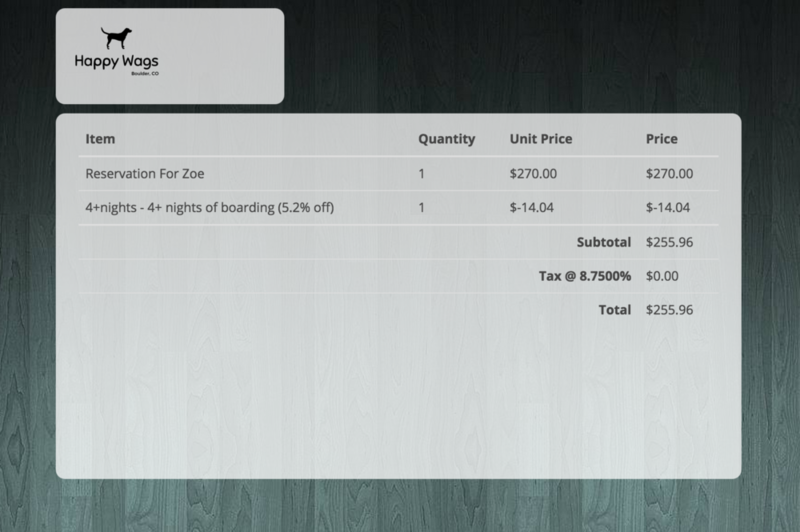 This application will update with a live view of the shopping cart so your customer can see what you're charging. Your employee swipes the credit card into the computer, and once approved, the customer is presented with a tip selection screen (optional). Finally, an electronic signature is collected. 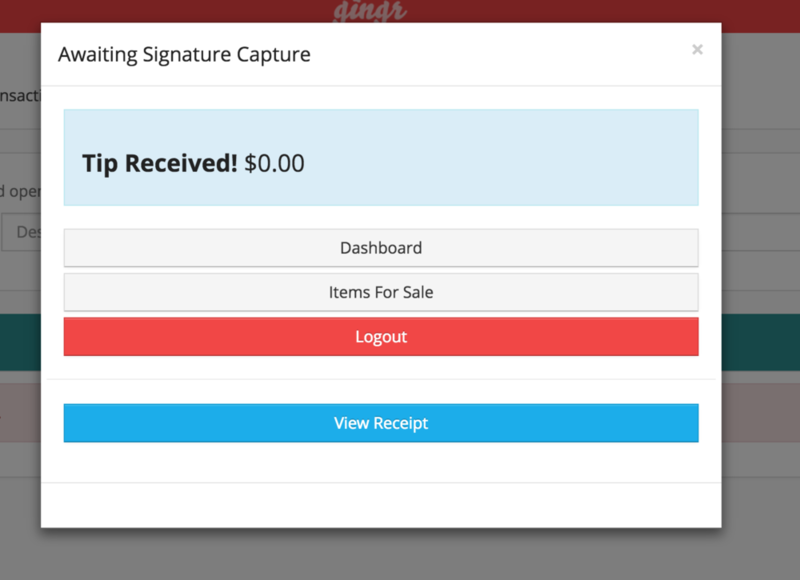 The signature is stored forever inside Gingr’s secure remote servers and your customer is emailed his or her receipt automatically. If you ever need to retrieve that information, it’s all right there within Gingr. But, if you would like to print a receipt we can handle that too! The printed receipt will include the electronic signature (even on standard receipt printers). The tip amount will be shown to the employee, and is automatically charged and saved to the database – there’s no need for later tip adjustment at the end of the day. As always this entire process utilizes the latest security available including tokenization, end-to-end card encryption, and TLS v1.2 for all requests. Using our deep understanding and connections within the merchant services industry, we've been able to secure a discounted rate for all of our customers. Through our integrated credit card processing solution, we will save all Gingr customers 20% off their current fees, with most clients saving between $20 and $200 per month depending on their volume. Awesome! We want to tell you more! Shoot us an email to credit@gingrapp.com. We try to always answer your inquiries within 24 hours, but due to recent volume increases that may not be possible. We prioritize current customers over sales to ensure a top-notch support experience. Thanks for your patience. Live updating shopping cart. Your customers can see what you're charging them for. Choose a preset tip %, custom dollar amount, or no tip. Customer can sign and complete or cancel their transaction. Once complete, this customizable thank you message is displayed. Employee's screen updates once the customer completes or cancels their transaction. Tip amount is communicated back so that you can thank the customer.